After a rather mild start, winter is here and holding on. No matter, there's plenty to do while the ground is frozen and the fig trees are resting happily in our garage. We've been up to a good bit of planning this winter and wanted to give an update for what to look for in the coming year. We're excited about what's to come and hope you will be too. Okay, maybe not as excited as us, but only because we're big plant nerds. Big news! We've officially started our organic certification process! We're pursuing our certification through Pennsylvania Certified Organic (PCO) and hope to have our first crops certified in June of 2017, 2018 at the latest. It's a three year process for crop production and we hope to eventually have the majority of our production certified. Look for organic u-pick raspberries, blackberries, and black raspberries in 2017! Once again we've started a number of fig trees in our basement for sale in the spring. We're attempting to root around 160 trees, not nearly the 450 we went for last year but enough to sell and keep us busy. We've pared down the number of varieties based on what sold last year and interest from our customers. I've included a list below for those interested. We're still somewhat undecided about shipping figs this spring since we'll be busy with quite a number of projects, so stay tuned. Trees will always be available for pickup here at the farm. Fig starts just 2-3 weeks into the growing process. We're growing in a much warmer basement (77-79F) so progress is much faster this year. Young leaves on a Syrian variety, 'Qalaat Al Madiq'. We received some cuttings from a good friend and will be trying this variety along with Chiappetta, Dottato Nero, and Izbat An Naj (Egyptian variety) this year. After a year of cover-cropping we're finally ready to begin planting a portion of the land. We'll continue our cover crop rotation on the remainder of the land to continue building soil while gradually taking over the entirety. This year's plantings are brambles (raspberries, blackberries, and black raspberries) and hardy kiwi berries (fuzz-less, sweeter, grape-sized versions of what you're used to in the grocery store). We've been busy selecting the best-tasting, productive, most disease-resistant berries that will cover the longest harvest span. We'll be putting in almost 1,000 plants along with all of the supporting trellising for the planting. Brambles can begin bearing in the year they're planted with a half-decent crop the following year. Expect that we'll open the u-pick for these early and mid-summer berries in June and July of 2017. Planning out varieties, spacing, and irrigation for our bramble planting this year. One of our goals has been to offer fruit trees and bushes to the home gardener who desires to grow their own fruit. We've dedicated about an acre of land to a nursery area containing display plantings of our favorite fruiting trees, the trees available to purchase, and some greenhouse and fig growing space. We'd like to incorporate espaliered pears, apples, and other fruiting trees, plantings of rare and unusual fruits, and highlight some of the low maintenance fruits you can grow in the area. The area we've set aside was planted with a low-growing grass mix this past spring. The mix of grass we used was designed for orchards to reduce maintenance but still provide nice walkways. It's supposed to only require 1-3 mowings a year and minimal inputs fertilizer-wise. If it proves itself we'll continue using it on the remainder of the orchard. With all of that said, neither of us are trained landscape designers so we've been playing around with some possible designs for the space to make it both attractive and functional. We'll keep you updated! Got ideas for us? Please leave them in the comments! Attempting to come up with a design that is functional, beautiful, easy to maintain, and that will allow us to expand in the future. Not an easy task! 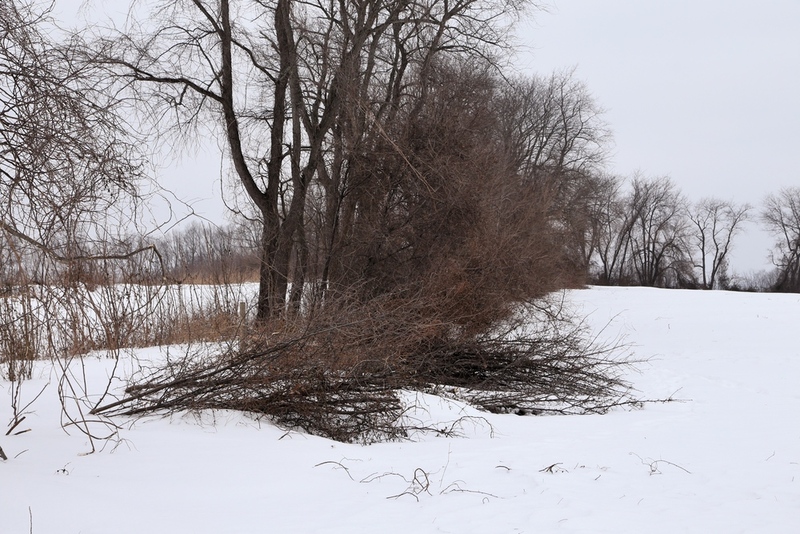 From the beginning, some of our biggest concerns with the orchard were weeds and preventing deer damage. Our property was fenced back in the 90's when a tree farm was located on the property. The tree farm business stopped sometime in the early 00's and since then the forest has tried to reclaim its lost ground. We've been pondering how to best maintain a clean fence row without resorting to herbicides. This past year we fenced in two-thirds of an acre of pasture for our Nigerian dwarf goats and chickens. A portion of that was a really overgrown and weedy patch that we didn't bother to clear prior to setting the goats loose. They loved it. Every day they would walk past lush green grass to feed on every kind of weed and brush imaginable. That got the wheels turning. Turns out goats love to eat the kinds of weeds that thrive in farm fencerows: brambles, multiflora rose, poison ivy (crazy, right? ), and honeysuckle. They'll girdle young trees and strip them of leaves. They're masters at land-clearing and eating down weeds. Goats get a free meal and we get a cleared fencerow, sounds like a win-win to me. This summer we'll be fencing in almost our entire property, twice. We hope to let the goats in the fence by mid-summer to begin the clearing process. If all goes according to plan they'll have cleared a little over an acre by the time fall rolls around. In addition to weed control, we hope the fence will serve a second purpose: keeping deer out of the orchard. I've heard that it's best to exclude deer from an area prior to planting, that way they don't know what they're missing on the other side of the fence. If they're used to browsing on fruit trees, then fencing them out becomes a much harder task. This approach seemed to work at our old property. We put up a 6 foot deer and orchard fence there prior to planting and no deer have bothered it. Okay, there was one or two times, but only because the gate was left wide open by the guy writing this article. Chopped down brushy flowering pears become winter snacks for the goats. They'll clear these limbs of bark and buds. Starting to clear the fence row of brush. We'll first pull down existing old fence wire, chop down larger trees, then bush hog the area to get it ready to put up new goat fencing. As I write, snow flurries are falling and snow blankets the land. Before long though, crocuses will bravely venture above ground and buds will begin to swell. Spring is not long off. In the meantime, we'll be busy making final preparations and doing any work we can ahead of time. We have a busy spring ahead of us! Lord willing, those are our plans for this year. Let us know what you think in the comments!